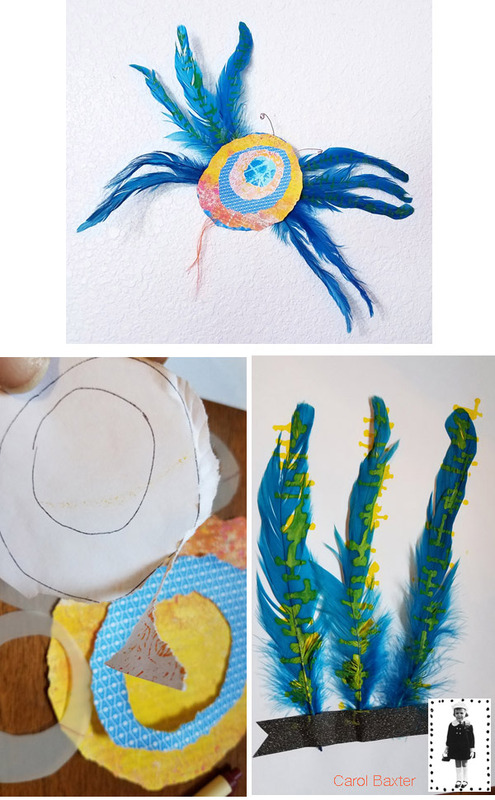 Our amazing StencilClub Voices Natalie Lewis, Margie Murphy, Beth Broadway, dove into Playtime with vigor! Up close, the textures and colors are quite fun. 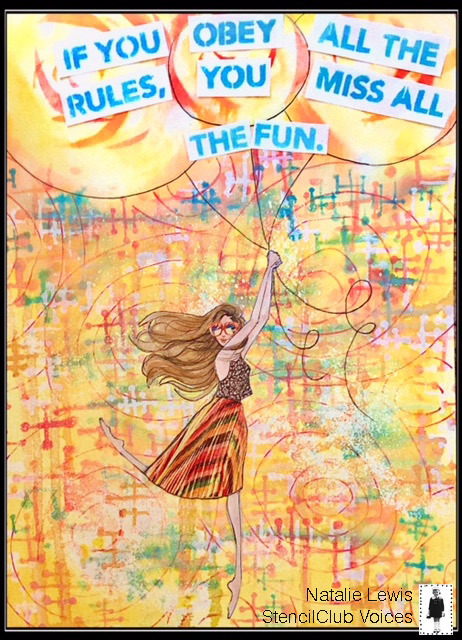 Natalie writes, "I used Tim Holtz Distress Oxide Inks and the resist spray on the background. Very cool texture. Stenciled the words and drew the girl, filled her in with markers. Used a glue stick to add words and girl to the background." 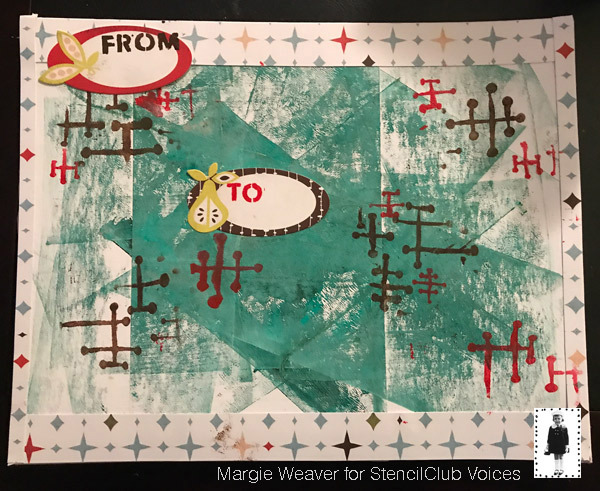 Margie recycled a StencilGirl® mailing envelope great for sending something cool to a friend or using as a gift certificate or gift card holder. Margie writes, "I love retro anything, so the large stencil really spoke to me. The background is just roller marks from cleaning off my roller after using the Gelli plate! 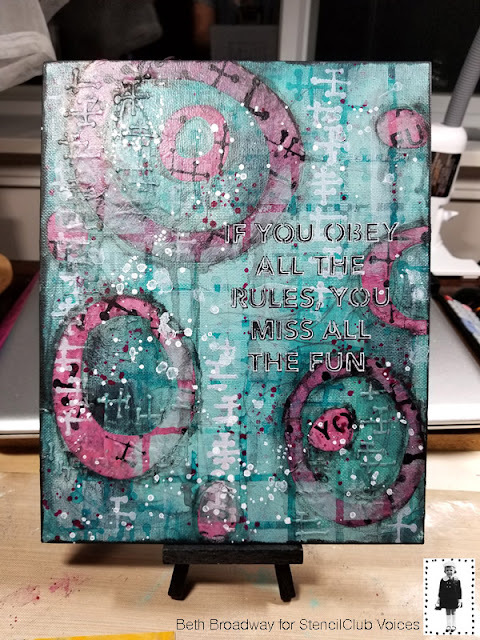 Used the large and small stencils and acrylics, as well as BasicGrey “offbeat” line paper and stickers from my extensive stash." Beth writes, "What a versatile set from Carolyn Dube. The possibilities are endless." "I started with an 8x10 white canvas panel. Using the mini and 9x12 stencils, I created the base with black gesso and modeling paste. I used various acrylic paints and glazes for the background. I cut circles out with the 6x6 stencil from gelli prints I made using the stencil set on deli paper. Using tips from my recent class with Mary Beth Shaw, I tied them together. I added pink splatters and stabilo-all pencil with drippage. I applied black paint and white gel pen through the mini stencil for the sentiment and white splatters for the final touches." You never know what will fly in on the winds of a monsoon storm! This air elemental landed on my office closet door. I traced shapes from the small stencil on papers from my stash, including a blue security envelope, and then tore them out instead of cutting. I made "feelers" out of wire, and cut orange threads for the tail. 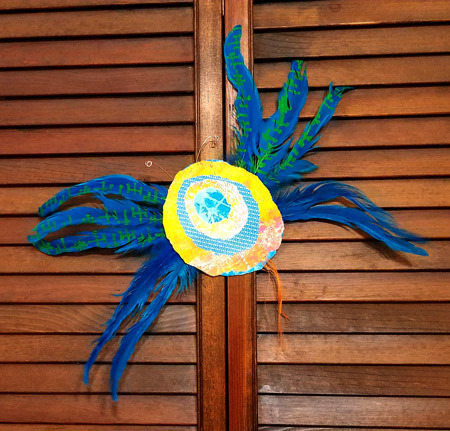 I used the large stencil with yellow paint to make the top 3 feather wings. Carolyn is a prolific designer and loves to play in her studio. You can find the wide variety of her stencils on our website. 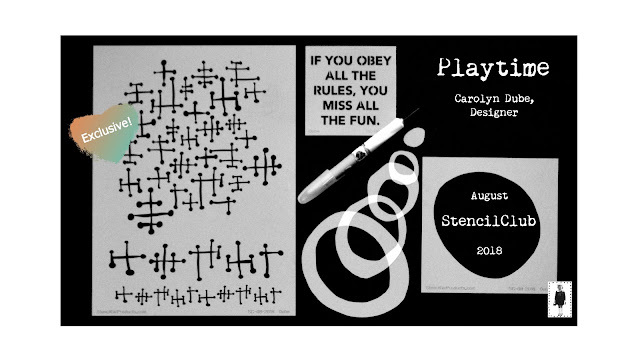 Don't miss out on Playtime and the tutorial Carolyn has created to go with these 3 member-exclusive stencils! Check out Carolyn's intro. 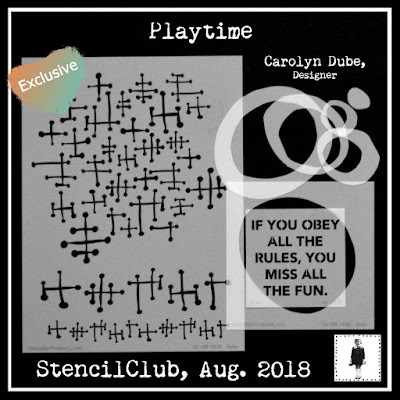 Get the details on joining StencilCub HERE. Thank you again for allowing me to be a part of the StencilClub Voices! It was a wonderful experience. Bothe July and August sencils were amazing and will definitely be used frequently in future projects. Great work from everyone. Thanks for sharing.